YMAC’s Teri O’Neill, and Stan Stylianou with Minister Garrett at the announcement. 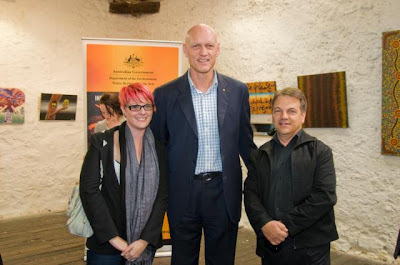 Peter Garrett, Minister for Environment Protection, Heritage and the Arts has announced that YMAC has been successful in securing $97,000 to progress the current Woodstock Abydos Heritage Project. Woodstock/Abydos is located in the East Pilbara region in the traditional country of the Kariyarra and Palyku people. The area contains numerous sites of cultural and historical importance including mythological, ceremonial, artefacts, engravings and paintings. The grant will be used to undertake a comprehensive survey of the Woodstock Abydos reserves, in conjunction with Traditional Owners and government agencies, to record previously undocumented archaeological sites.